How to Lose Water Weight Fast - 5 Easy Steps that Work! 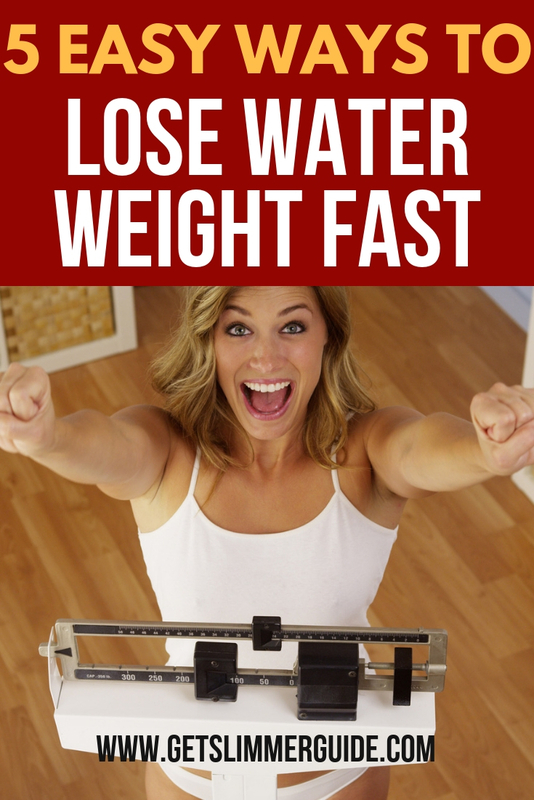 Tips on How to Lose Water Weight Fast! If you are looking for how to lose water weight, then you’ve come to the right place. There are several things that can cause you to gain water weight and these include pregnancy, too much salt consumption, not drinking enough water and many other factors. When you consume too much salt, the sodium can cause the body to store fluids. The same is true when you don’t drink enough water. The body begins to think it is being dehydrated, so it protects itself by storing water. This process of storing water causes the skin to become puffy and swell. This is called water weight. Gaining water weight isn’t just uncomfortable, it can also be problematic if you are trying to lose weight. This is because it makes you look bloated and feel heavier. And my mission today is to reveal some of the vital steps you can take to flush the excess water out of your body so that you can feel lighter and look leaner. So keep reading to find out! It may seem a bit contradictory, drinking water to lose water weight, but water weight is usually an issue when someone is suffering from dehydration. Drinking the correct amount of water will help the body release the fluids it holds to protect itself from dehydration, which relieves bloating. Water also works as a great cleanser, leaving the body feeling lighter. However, it’s important to drink water carefully. Drinking it through a straw or taking it in big gulps will let large amounts of air into the stomach, which will cause it to swell even more. Related: Does Drinking Water for Weight Loss Really Work? For people who experience water weight bloat frequently, one option to help prevent it is to minimize the intake of alcohol. Alcohol, even in the smallest amounts, leads to dehydration. As mentioned above, dehydration is one of the leading causes of water weight. Alcohol should be avoided or extra water should be added to the daily diet. For those who struggle with the idea of cutting back on alcohol, there are several alternative drinks that can be just as delicious, but without the side effects. Drinking vinegar is a great option for an after dinner drink and they’re filled with nutrients that are great for the body, all while keeping bloat under control. One of the most effective ways to lose water weight is to sweat out all the fluids that the body isn’t releasing. This can be done in a number of ways. For those who have time, exercising for 30 minutes a day is a great way to rid the body of excess water and keeping the bloat down. Some of the best exercises to promote a lot of sweat are cardio and high-intensity workouts. Another option, for those who don’t have the time to exercise as much, is to visit a sauna or get a steam bath. These are very laid back ways to sweat out the water and reduce bloat. Of course, this is only a quick solution, since sweating can lead to dehydration, so there needs to be a sharp increase in water intake after using these solutions. However, done consistently, sweating can keep the body free of the toxins and fluids that cause bloat. As mentioned above, having too much salt in the system can result in the body trying to store extra fluids, which causes water weight and bloat. A simple solution to this salt imbalance is for people to adjust their diets and start eating less salt. Reducing the amount of salt, or sodium will allow the body to release the extra fluids and let the metabolism run the way it needs to prevent bloat. There are several ways a diet can be adjusted to limit salt consumption. One way is to be more careful about what food items are purchased, especially canned and frozen items. By checking the amount of sodium on the packaging of these food items, people will be able to keep a closer eye on how much salt they consume. Another way to adjust salt levels is for people to be wary of how they flavor their foods at home. Instead of adding more salt to a dish, herbs and spices can be added to give it more flavor. Over time, these little changes will add up and help minimize bloat. Fiber works in the opposite way that salt does in the body. While salt makes the body hold on to toxins, fluids, and chemicals, fiber helps the body flush out the system. Fiber is especially helpful for digestion, keeping things moving and leaving the body before it causes any bloat. It may seem intimidating at first, but adding fiber to a daily diet is actually quite simple. There are many natural foods that contain high doses of fiber that can be incorporated into meals without any stress or hassle. Whole grains are a great source of fiber and can replace white bread and pasta to add more daily fiber. So instead of white bread, you can try oatmeal with berries for breakfast. By so doing, you will be upping your daily fiber intake, which will inherently help flush out the excess water from your body. Yes, water weight can be a pain, but there are solutions you can utilize to get rid of it so that you can achieve your weight loss goals. Did you find the tips on how to lose water weight helpful? Feel free to share your feedback using the comment form below.